Before Alfred Hitchcock was a director, he was a set designer in Britain’s silent film industry. 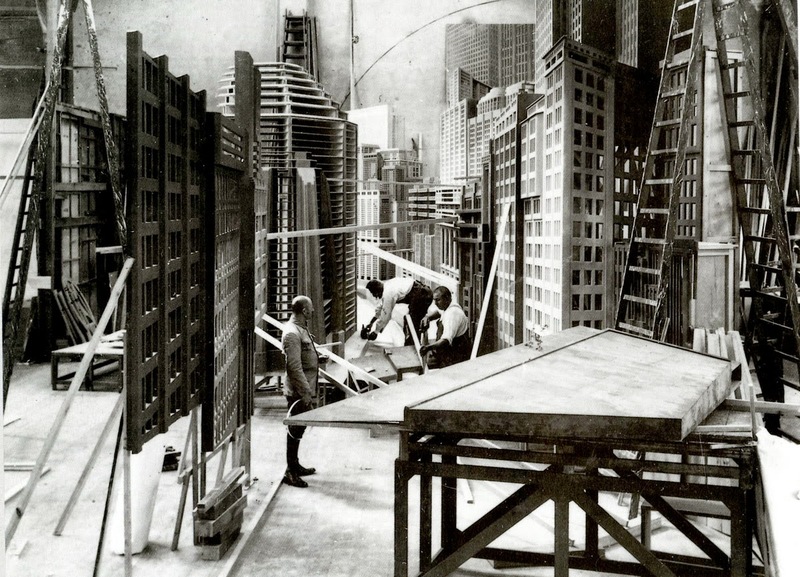 While yet an underling, he directed from behind, building sets that could only be filmed his way. “I was quite dogmatic,” he said. “I would build a set and say to the director, ‘here’s where it’s shot from.’” Even as an apprentice, he knew too much. Unlike live theater, which can take place on a street corner or an empty stage, cinema relies heavily on its locations to carry the storytelling weight. That’s the lesson Hitch learned while running around with Weimar directors like Fritz Lang and F. W. Murnau. From the furtive environs of a gas station john to the stone-faced mugs of Mt. Rushmore, Hitch’s settings defined his characters. They were the story. He worked his sets as hard as he did any of his human talent. In his book, “The Wrong House: The Architecture of Alfred Hitchcock,” art historian Steven Jacobs looks intently at Hitch’s preoccupation with man-made spaces. Focusing on the point where cinema and architecture intersect, he takes readers on a film-by-film architectural tour—complete with floor plans copied from both surviving documents (sketchy) and a painstaking study of the films themselves (laborious). Jacobs’ wealth of knowledge about architecture delivers numerous insights into a relatively unstudied aspect of Hitchcock’s—or anyone’s—films. Then he interprets what he sees. While most writers offer only the what, Jacobs offers the illuminating why. His bias is endearing. The book “starts from the absurd premise that all the important buildings in [Hitchcock’s] films are designed by one and the same architect whose oeuvre includes a modernist villa in South Dakota, a London apartment, a suburban house in a Californian small town.” It’s a novel concept, not one that would likely come from the often-hermetic mind of a film studies professor. 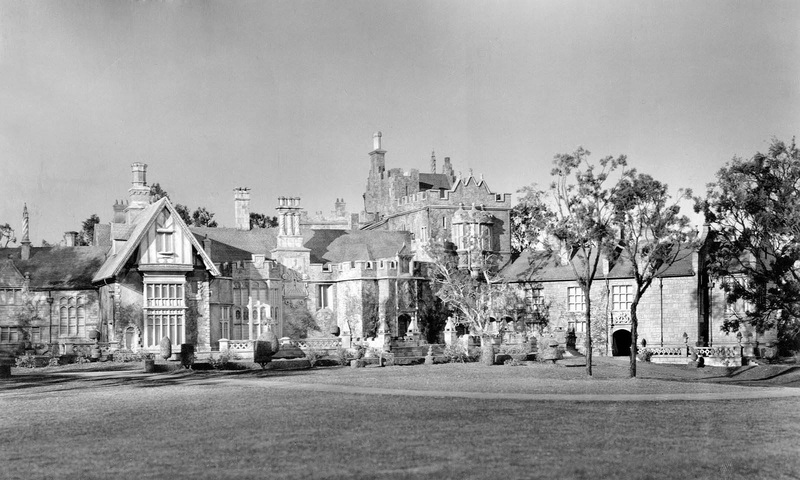 Jacobs devotes about 20 pages to Manderley, the colossal estate that looms so heavily in Rebecca. One of those rambling mansions that was enlarged over the centuries, its labyrinthine floor plan, forbidden rooms and chambers built to accommodate the complicated servants’ hierarchy accommodated a social life that ranged from solitary gloom to ballroom shenanigans. It suited the film’s Gothic plot perfectly. The sets' ample floor space also gave Hitch the opportunity to mess around with prolonged tracking shots. Jacobs notes that, while parts of the house seem to date to late medieval times, other features, such as the bay windows, would have been built in the Victorian era. Still other parts are Georgian. It was an architectural Frankenstein (another character who mourned, and then avenged, his continued existence). It’s hard to pinpoint when Manderley came to dominate the lives of its masters and servants, yet that narrative is embedded in its endless walls and vast ceilings. They’re a visual correlative to Maxim De Winter’s history—recent and ancient—which, like Laurence Olivier’s eyebrows, never stays put. In Rebecca, the past keeps insinuating itself into the present. You can never go back to Manderley; it keeps following you. No wonder Maxim was always so touchy. Ironically, there was no real-life Manderley. Just a soundstage-sized miniature, along with a few other models and partial walls all knit together with editing and special effects. Though it was based on photos and sketches made during Hitch’s scouting trips to the English countryside, Jacobs reminds us that it was designed and built by the great art director Lyle Wheeler (who, incidentally, also designed the plantation house "Tara" in Gone with the Wind a year earlier). These unsung heroes contributed more than you’d think. Until the 1960s, studios kept all these professionals on payroll, which gace each studio its own look and style. Thus, while much has been written about the “Hitchcock look,” Jacobs sees it from the opposite end: “The look of a Universal Hitchcock film, such as Shadow of a Doubt, differs considerably from an RKO Hitchcock film, such as Suspicion, made two years later. Unmistakably, this difference is due to the influence of… each studio’s supervising art director.” As a result, you can geek out on the style of one art director just as you can one actor, director, writer or composer. Who knows? If this Hitchcock Geek thing doesn’t pan out for me, I might become an Edward Haworth Geek. Haworth, an art director, recalled that on the set of Strangers on a Train, if Hitch needed time to think a scene through while shooting, “He would say, ‘everybody get lost for a few minutes,’ and [he’d] chase everybody body out of the room—but never the art director.’” Then the two might consider the best way to approach the scene. Hitchcock himself acknowledged the role of such unsung heroes. “When I’m sitting there with a writer and we’re designing a scene, I’ll say, ‘I wonder what we can do with that. What sort of setting should we write this for?’ We bring in the production designer while the script is being written.” Such collaboration contributed to the richness and re-watchability of Hitchcock’s films. Really, all members of the team are—or should be—storytellers: the writer tells the story on paper; the art director and others tell the story using the tools they work with. That’s the way Hitch saw it. Hitch was such a good self-promoter that it’s easy to forget what his day-to-day was like. He respected those members of the team who brought more to the table than a good day’s work, and they got to have a hand in helping shape some of cinema’s finest moments. For a treat, and to illustrate what we're talking about below, watch this stunning Rear Window Timelapse from Jeff Desom. As such, Jefferies assumes the position of almost god-like omniscience, which he clearly relishes and uses to his advantage to try to ensnare the killer Thorwald. But here's where it gets interesting. Jacobs goes on to observe that Jefferies' courtyard is actually a neighborhood of other rear windows. He writes: "Rear Window clearly deals with the contrast between formal and representative facade and informal backside, which is one of the essential characteristics of modernity." Jacobs sees a thriving neighborhood of folks who’ve moved to the city precisely because of its “relative isolation and lack of interference in the everyday life of others.” The film isn’t merely a “commentary on the alienation of modern life” as John Fawell puts it. This imperfect, sloppy neighborhood has a heart. It is very much a community. Jacobs concludes, “It announces a postmodern urban space, the boundaries of which are no longer defined by architectural structures but by the screen and the lens.” He nails what I like so much about urban living. This movie also foreshadows life in a digitally-mediated world. You can see why I like the guy so much. He does for Hitchcock and architecture what I’ve been trying to do for Hitchcock and art. It’s hard to imagine that insights like this could be supplied by a film studies academic. (For one thing, the writing would be more abstruse. Jacobs keeps it simple.) This topic demands expertise that’s usually outside of their professional scope. Jacobs’ resume is a bit different. He’s an art historian first, specializing in “photographic and cinematic representations of architecture, cities and landscapes.” As such, he was ready-made to write this book. Obviously, there’s a place for theoretical film scholarship. But movies are made by a diverse range of people, from crafters and tradespeople to philosophers and artists—not to mention legions of expert “story consultants.” It only stands to reason that they can’t really be explained without critical contributions from a diversity of voices. Unfortunately, it's the film studies professors' work that dominates this field, and for obvious reasons: as a whole, they're writing more; I also think that publishers see them as a safe bet. We need to hear more from the geeks. At 342 pages, Jacobs’ book only scratches the surface of possible examinations of Hitchcock’s architecture—not to mention that of other directors. In breaking open a new topic, it paves the way for others to pitch in with their own discoveries. I hope to see more books just like it. Do your part to make that happen. Buy it. Originally, the art director was simply in charge of designing and building the sets and left the set “the moment it’s painted” (Hitchcock). But the job has evolved and is often synonymous with that of the production designer, who’s charged with overseeing the overall look of the film, including setting, set design and set decoration. Some of the most original—and useful—ideas about Hitchcock’s films have come from people for whom film study is a secondary interest: Tania Modleski (“The Women Who Knew Too Much”) is an English professor with an emphasis on gender studies; Camille Paglia (“The Birds”) is a generalist cultural critic. Many fantastic books have come from individuals who work outside of academia—fans and geeks. Now to mention the first 60 episodes of Perry Mason and about 350 additional movies! Wheeler is a forgotten name by most, but among those in the know, he's called the Dean of Art Directors. They also got called back to work with him again. In the 50s and 60s, Hitch’s team of regulars variously included Robert Boyle (art director and production designer), Bernard Herrmann (music), Robert Burks (cameraman), George Tomasini (editor), Edith Head (costumes), Peggy Robertson (script supervisor) and others. Their fingerprints are all over some of Hitchcock’s—and Hollywood’s—greatest movies. Published in “After Hitchcock: Influence, Imitation and Intertextuality,” 2006. Joel, you did it again! Always great to read some fresh perspective on Hitchcock and the artistic strengths of the "house styles" of the major studio system. Great "Rear Window" video as well. It's not surprising that Alfred Hitchcock was involved in moving sets around. His films are very well constructed around the proper placement and removal of items to create a certain feeling for each scene.